Join Pakistan Navy as Female Steward as Sailor (S) Batch C-2018: Applications are invited from all the females out there who want to join Pak Navy. 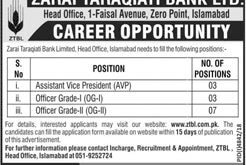 The advertised posts are for Pakistani Females only. Candidates must have done matriculation in Science/Arts with at least 50%. Must be 16-20 years of age at 1st March 2019. Must have height of at least 5 (152.4 cm). 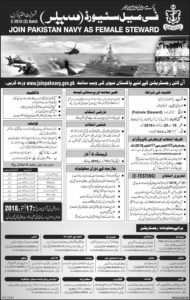 All the applicants are requested to bring in Rs.100/- as test fee on the entry test day or should sent postal order on the name of Director Recruitment Naval Headquarters Islamabad.